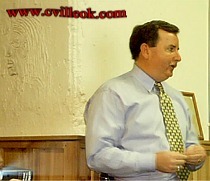 Mike Tinker (Collinsville City Manager) presented a slide show and answered questions at the Chamber of Commerce lunch time meeting March 4th. 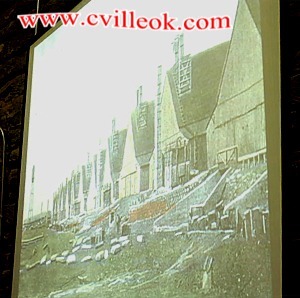 Mike's show began with some reminders of Collinsville's flourishing past with the streets lined with people when the smelters and brick plants were booming. Tinker transitioned to recent city improvements and anticipated growth with three housing additions totaling more than 235 lots for new houses. The Victory Energy Addition south of town will be bringing new jobs when completed. Bids will be unsealed for review Friday (Mar. 5th) and cleanup and stabilization of the burnt out City Hall building can soon begin. 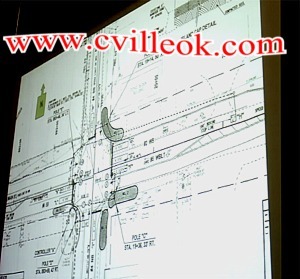 Detailed plans for the improved intersection at 5th and Main were shown. That project is on ODOT's April bid list and work could begin shortly after that. Tinker indicated there would be islands, pavement trips and video monitoring which would allow improved traffic flow through that busy intersection. The Chamber's membership blitz is wrapping up and those receiving invoices this week are requested to return their memberships as soon as possible this month. Bids are out for electrical work at the Chamber's future office. A work day for chamber members is also being planned.